Pilot’s Iroshizuku line of inks has become incredibly popular in the last couple of years thanks to its agreeable performance and excellent color palette. 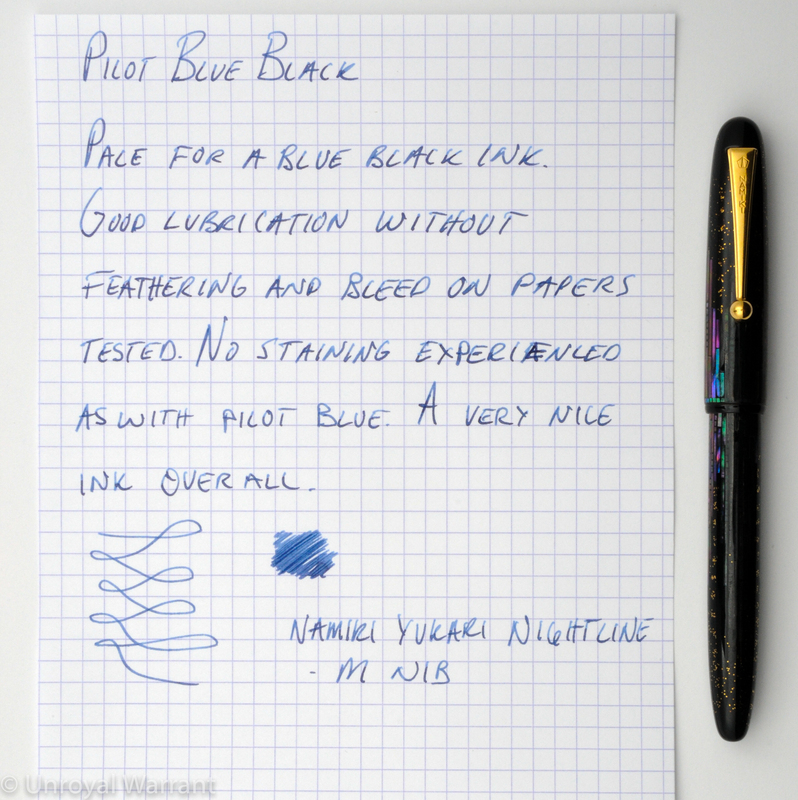 Despite Iroshizuku’s success Pilot still produces it’s original more affordable ink line that is simply branded as “Pilot” (or “Namiki …or “Pilot/Namiki”). It is my understanding that these inks have a ph of over 7 making them basic and as such I would caution against putting them in a pen where ink makes direct contact with celluloid. This line comes in bottle and cartridge formats. The cartridges only fit Pilot and Namiki pens. There are seven colors produced in the cartridge format. In bottle format I have only seen three colors: blue, black, and blue black. Pilot Blue Black is a bit pale for my tastes but the upshot is some nice subtle shading. The ink provides some good lubrication, making it a great choice for dryer writing pens. I had no issues with bleeding or feathering. I also saw no nib creep (as is common for lubricating inks). I found that this ink was easy to clean out unlike Pilot Blue which has a tendency to stain. Packs of 12 cartridges go for $7 and 60ml bottles go for $12. 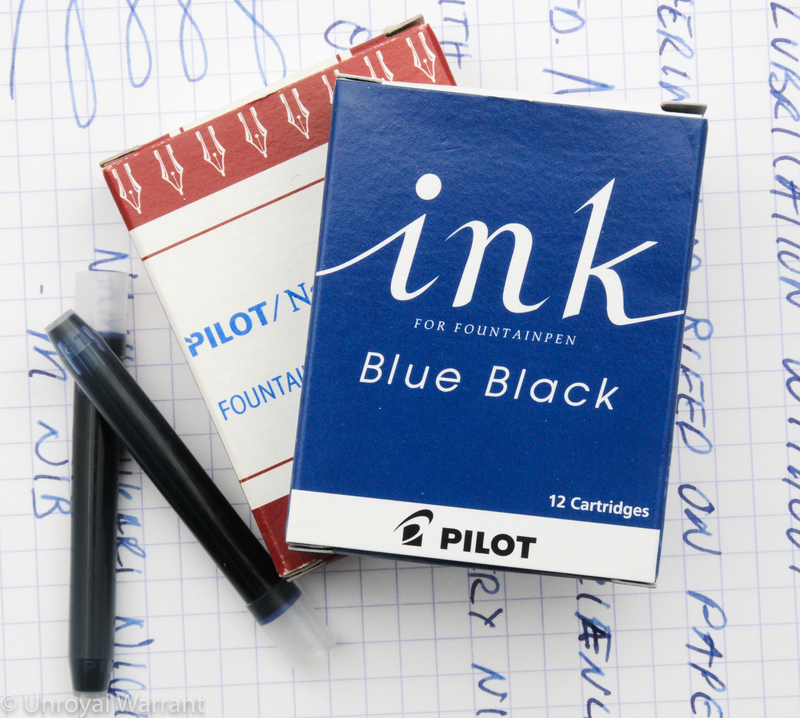 The affordable price makes Pilot Blue Black a great workhorse ink that would be appropriate for the office and general correspondence. There is also Pilot red ink in 30 and 350 ml bottles. Thank you Bruno good to know!